I came across this picture on pinterest and it really hit a nerve. I’m sure like me, every girl dreams of a perfect ending. I know I did and even now I still do sometimes. I always dreamt/imagined that I would marry, buy a beautiful big house (one with white chequered windows and a little picket fence), have lots of children running around in my perfect garden and the sun would always be shining. Reality is so very different. You cannot plan your life and especially not the end. 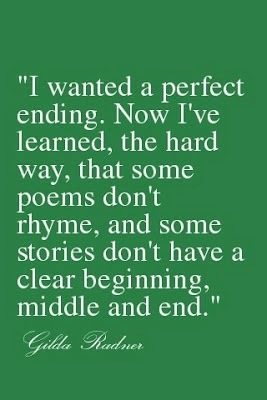 There is no such thing as a perfect ending because life is out of our control. Unfortunately I have learnt this the hard way. As a child I looked up to my Nana & Grandad. They had (to the outside) the perfect life. My Grandad worked hard to provide for his family and they were always jetting off on holiday, redecorating their home or buying new cars. They spent most of their lives together as a unit. Now they are being ripped apart from each other and unable to live the end of their lives together – just as they should. This has been such a shock for the whole family; I cannot imagine how it must be for them. Especially my Grandad who has always looked after my Nana and now there is nothing he can do for her! It just goes to show how unpredictable life can be. I know I am always guilty of wanting more. But from today I am going to try my upmost to enjoy everything I have an everything else.. Well what is meant to be will be! I have a beautiful daughter, a partner who wants to provide for us, a family who are more than amazing and a roof over my head.